The Charli tallboy combines practicality with beautiful design. Bring clean, sophisticated style to your home with this mirrored white gloss cabinet, a stunning storage solution in any bathroom. Increase your bathroom storage with the elegant Charli Tall Boy. A neat and sophisticated cabinet, the Charli Tall Boy contains enough space for all your storage needs. 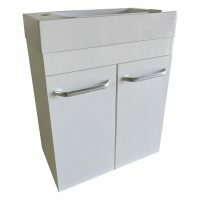 This cabinet is ideal for use in medium to small sized bathrooms where extra storage space is required. Stylish and modern, the Charli Tall Boy features a mirrored cabinet, backed by a high gloss finish in white. It includes two drawers and a large door with three adjustable shelves. 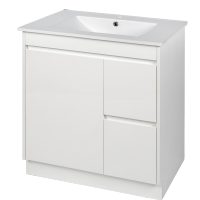 It comes preassembled with legs or a kickboard; however you can also install it as wall hung vanity for an extra modern touch. The Charli Tall Boy measures 1820x440x380mm in dimensions, offering plenty of storage for the entire family. 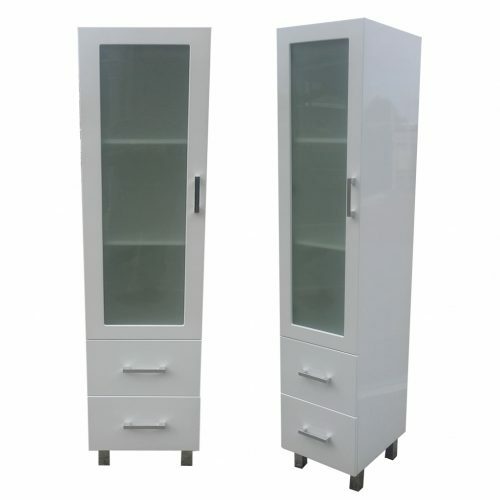 The Charli Tall Boy exhibits great workmanship and as a quality product, it will offer you many years of service. It is highly resistant to moisture and will not rot or lose its finish over time. 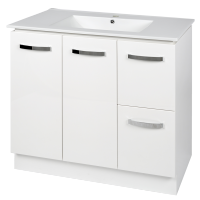 You can keep this vanity unit in pristine condition by simply wiping with a damp cloth and rubbing off dry. The Charli Tall Boy is available at an affordable price and it offers incredible value for money. Moreover, this item is available at Ross’s Discount Home Centre at an unbelievable bargain. Make the most while stocks last – buy this great storage solution for your bathroom today!